Since October 2007, Hibiscus in Maddox Street in Mayfair has been the London restaurant of the Lyon-born, Michelin-starred chef Claude (b. 1972) and Claire Bosi. Claude Bosi started his training at the famous brasserie Léon de Lyon and then went on to work for a number of famous French chefs, among whom Michel Rostang, Alain Passard and Alain Ducasse. In 1997 he moved to the UK to work as sous-chef in the restaurant at Overton Grange in Ludlow. In 1999, when he had become head-chef there, the restaurant was awarded a Michelin star. In 2000 Claude and Claire Bosi opened their own restaurant Hibiscus in Ludlow and the restaurant was awarded a Michelin star almost immediately. The second one followed in 2004. 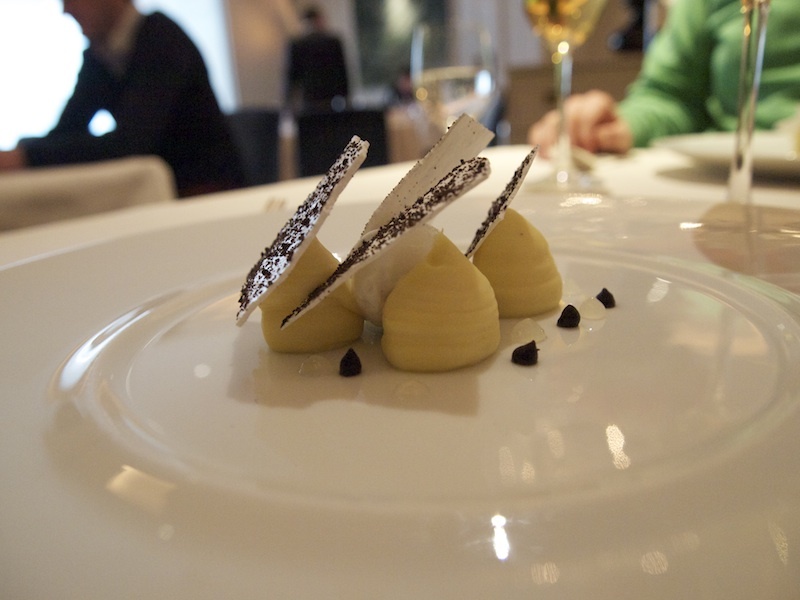 In 2007 Hibiscus was re-located to London and in 2009 the restaurant regained its two Michelin stars. Hibiscus is open for lunch and dinner Tuesday till Saturday. The restaurant offers a seasonal (currently: 'Flavours of Spring') tasting menu (3 courses £87.50, 6 courses £95, 8 courses £105) and there's a 3-course lunch menu for £34.95. I had lunch at Hibiscus with my husband on Wednesday 1 May 2013 and we both ordered the 6-course Flavours of Spring menu. First some nibbles and the bread arrived: lightly toasted cashew nuts and peanuts covered in malt vinegar powder and some green olives from Carcassonne. The bread (white and brown sourdough) was served with lightly salted Shropshire butter. 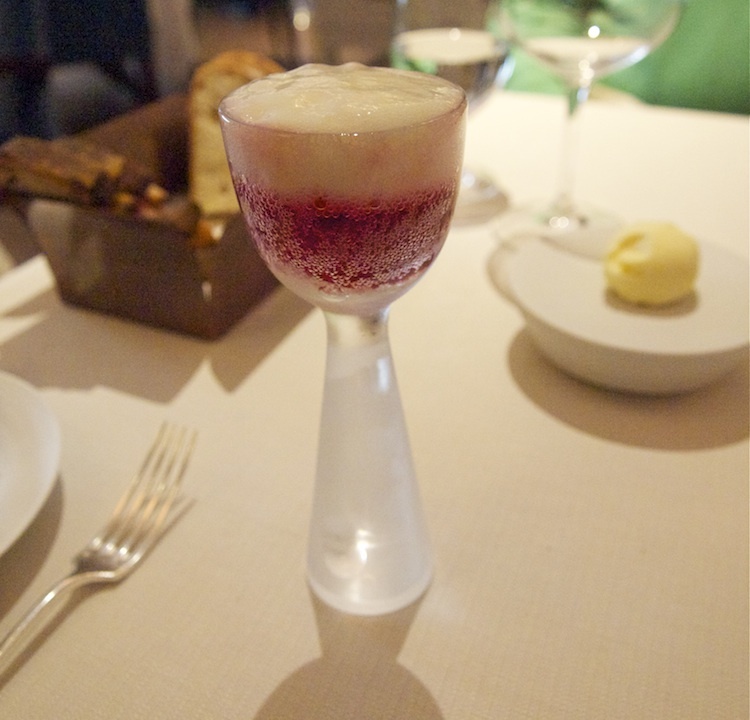 This was followed by Hibiscus' famous pineapple and hibiscus soda - hibiscus flavoured soda served with a light pineapple foam. Lovely and invigorating. The Flavours of Spring menu started with Wye Valley asparagus. 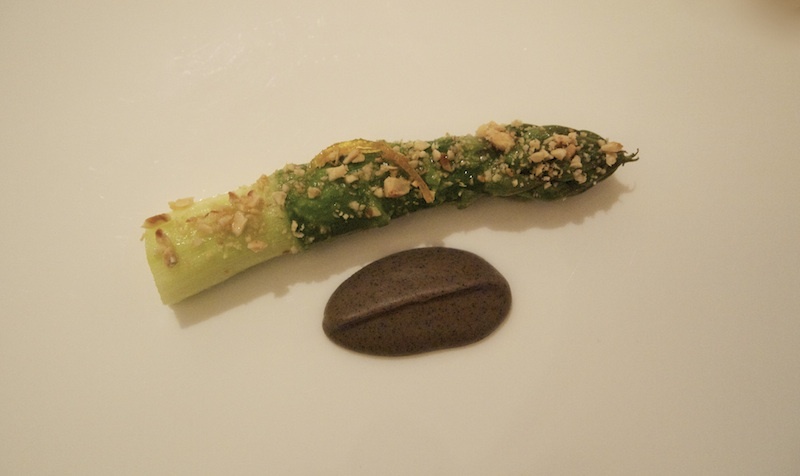 A lightly smoked plump and juicy 'al dente' green asparagus spear sprinkled with toasted chopped hazelnuts, some candied kumquat zest and served with a fabulous, pure and intense, truffle puree. Smoking the asparagus had given it a certain 'meatiness', which was lovely. The kumquat zest added a wonderful touch of sweetness and subtle bitters and the truffle puree delivered an elegant heartiness. Next up was Spring onion raviolo, pea 'spherification', broad beans. Beautifully made 'al dente' raviolo with a gorgeous filling of sweet of soft spring onions cooked in lime juice. 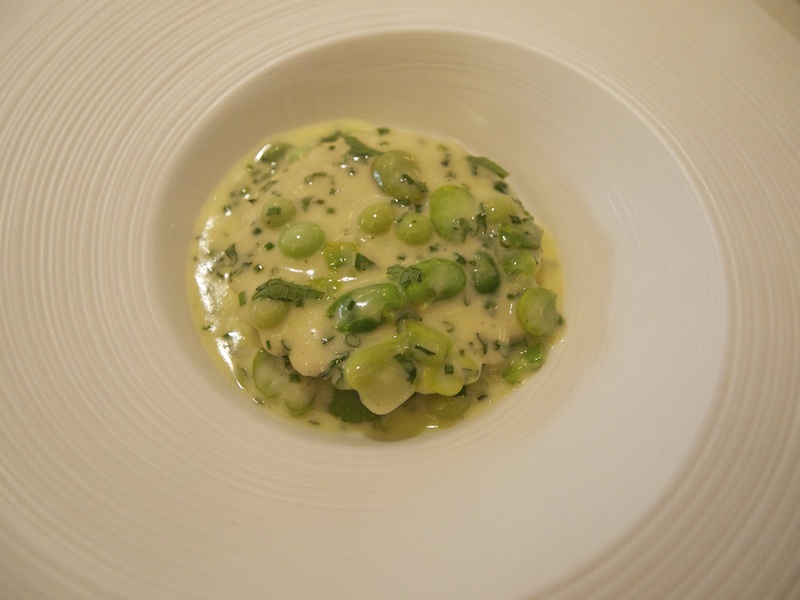 With the raviolo came fresh broad beans, pea spheres with a sublime liquid pea filling and a fantastic broad bean puree, delicately flavoured with mint. The spring onion cooking juices were used to make a delicious beurre blanc-like sauce with just the right amount of acidity. An energetic dish with great textures and very precise and refined, sweet and acidic flavours. Third course, Isle of Skye scallop with a pork pie sauce. 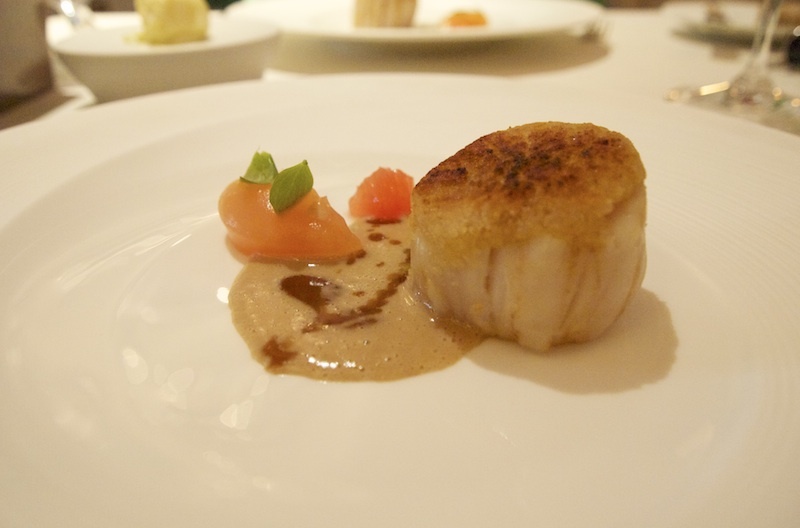 A large top-quality scallop with a hazelnut, apple and mustard crust, served with a pink grapefruit segment and a pink grapefruit gel. The scallop was perfectly translucent on the inside and the crust was well-balanced, with elegant sweetness from the apple and a hint of sharpness from the mustard. Great contrast from the terrific pork pie sauce which is literally made made by liquidising a pork pie, thus capturing all the characteristic pork pie flavours: brilliant. The lovely bitters from the grapefruit balanced this dish perfectly. Fourth course, Cornish bream, kaffir lime leaf, morels, coffee. Excellent piece of seabream with perfect crispy skin and stuffed with a wonderful kaffir lime leaf and morel mixture (right under the skin). The seabream was served on top of fresh juicy and buttery morels, kaffir lime leaf oil and some delicious coffee jelly cubes. Also on the plate was this absolutely divine mixture of Parmesan, finely chopped hazelnuts and coffee. 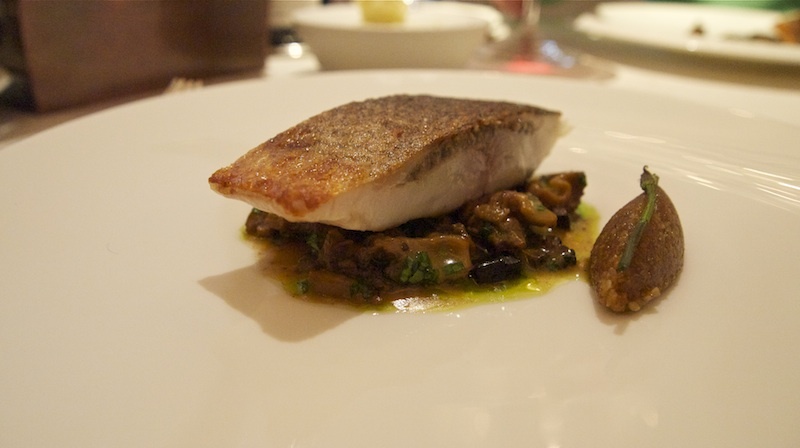 A marvellous dish with fabulous contrasting flavours that somehow combined perfectly with the bream. Lovely freshness form the kaffir lime and incredibly well-judged use of coffee. The coffee really delivered an extra flavour dimension and lovely bitters too. Very clever cooking. 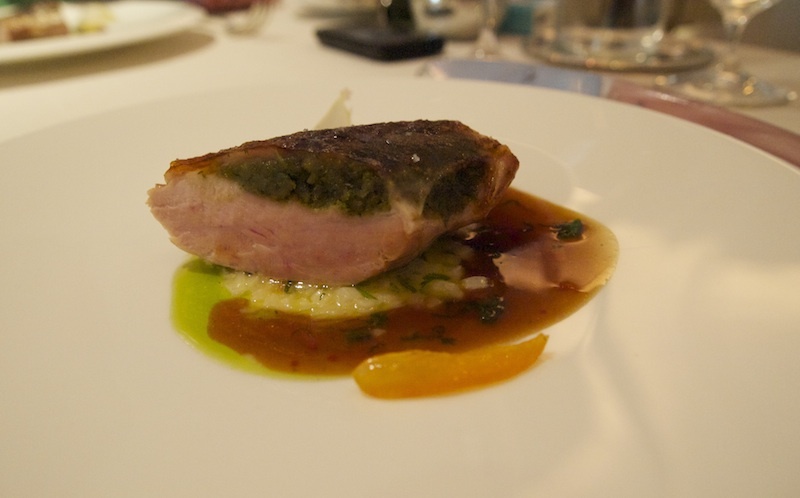 Fifth course, Guinea fowl, coriander, chilli, mint, candied kumquat. Perfectly cooked pink and tender guinea fowl with a brioche and coriander stuffing, served with a superb clean-tasting and well-balanced garlic, coriander, mint and chilli sauce. The sauce was well-reduced and therefore slightly sticky - which was wonderful. Even better was the white asparagus 'risotto' made entirely from asparagus. An inspired dish that shows an extraordinary level of skill. Beautiful balance between bold and elegant flavours; both the coriander and kumquat really lifted the dish and the coriander brought a lovely freshness to it. Time for the pre-dessert (no photograph). Gariguette strawberries served with a celery jelly and a Szechuan pepper foam. A delicious pre-dessert with a lovely fruity finish from the Szechuan peppers. Dessert was Asparagus cream, black olive, coconut. Three dollops of asparagus cream with a lovely smooth consistency, topped with black olive meringue shards and served with very well-made and clean-tasting coconut ice cream and small dots of black olive puree and lemon jelly. Loved the fabulous bitters and light sweetness from the black olives and the intensity of the asparagus cream was sensational. A stunning sweet-and-savoury dessert with a wonderful, long aftertaste. Pistachio, orange and cinnamon madeleines and White, caramel and dark aerated chocolate, served with our coffees. This was an outstanding meal. Claude Bosi creates very exciting dishes that display wonderful tension and energy. The flavours are intense and unadulterated and I would almost be tempted to call the food gutsy - if it wouldn't have so much finesse. The flavour combinations are often surprising and deliberately contrasting but from these contrasts Bosi always manages to achieve a synthesis on the plate that brings harmony and allows the main ingredient to shine. Hibiscus focuses on seasonal ingredients that are sourced very carefully from British producers, but the dishes Bosi creates from these ingredients clearly have a French temperament - Claude Bosi's temperament in fact. No understatement or stiff upper lip here; this is bold and stirring food but Bosi's very individual dishes manage to strike an excellent balance between power and subtlety. Front of house is presided over by Claire Bosi and their service was excellent. The wine list, put together very carefully by Claude Bosi and his very knowledgeable head sommelier Bastien Ferreri, is a veritable journey of discovery. It boasts many very interesting selections from small and often wayward producers all over France - the number of "Vin de Table" wines is striking. 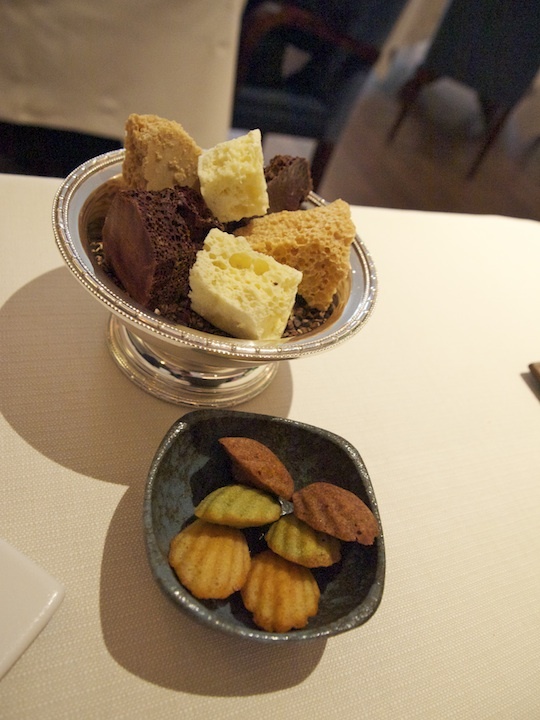 Hibiscus is without a doubt is one of the finest restaurants in London.